Numerical models of the global atmosphere have spatial resolutions that are much too coarse to resolve clouds and convection processes explicitly. Because these processes play an important role in the atmosphere and climate system, they are included in numerical models by means of simplified representations, so-called parameterizations. Traditional parameterization schemes for atmospheric convection are deterministic. To overcome the limitations of these deterministic schemes, stochastic parameterizations are being developed. 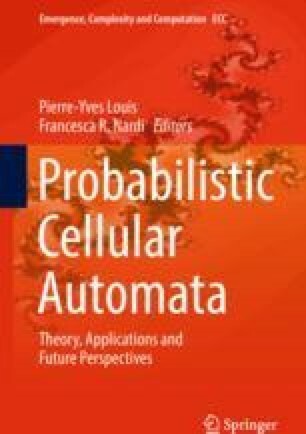 The use of probabilistic cellular automata (PCA) for this application is very new and can provide a way to generate spatial patterns of convection as observed in the atmosphere. It is approached from two directions, both briefly reviewed here. In one approach, convection and other sub-grid-scale processes are represented with deterministic CA. In recent work, this is extended to PCA. In the other approach, convection is represented by means of discrete stochastic processes (finite state Markov chains) on a lattice. In most studies in this direction, there is no direct coupling between neighboring lattice nodes, however recently such couplings are considered as well. To illustrate the concept of parameterization, a frequently used test model (the L96 model) is discussed as well in this chapter. Parameterization of atmospheric convection and clouds with PCA has several interesting mathematical aspects. One is the interactive (two-way) coupling of the PCA to a partial differential equation for large-scale atmospheric flow. The state of the PCA couples to the time evolution of the flow, and in turn the PCA rules (transition probabilities) depend on the flow state. Furthermore, for convection it is natural to consider N-state PCAs with \(N > 2\) rather than a binary (\(N = 2\)) PCA. Finally, statistical inference can be a fruitful approach to construct the PCA rules or transition probabilities for convection. The PCA dependence on the time-evolving atmospheric flow and the large number of configurations for PCAs with \(N > 2\) provide interesting challenges for such inference. DC is financially supported by the Netherlands Organisation for Scientific Research (NWO) through the Vidi project Stochastic models for unresolved scales in geophysical flows.